Sometimes we cannot see bad light. Almost every light source has its own colour. If the ambient light in a place is affected by the colour of the light our eyes ‘adjust’ that colour to white. When we take a picture with a camera it does not adjust, it faithfully reproduces it. Then, when we look at the picture, we see something called a ‘colour cast’. This is an odd overall colour in the picture. It’s caused by the colour cast affecting the colour tone of everything in the influence of the light. Normally, to get rid of the cast, we adjust our camera to this colour cast as white light – much as our eyes adjust. This is called ‘adjusting the white balance’. The light in the picture will look more like daylight again. We might not want to do that if the picture had the colour cast from, say a party, where the colours may be atmospheric. For many ordinary pictures that is not true and the artificial lights simply make the picture look odd. Light sources are a range of things that produce light. Sources of light like bulbs or fires have very different origins and temperature, therefore the colour they produce is unique too. In photography our lights can strongly affect the outcome of our pictures. That is especially true if the light source has a colour cast. Photographer’s use of artificial light sources, like camera flash, studio lights and other photographic sources, needs care. Any old light will not do the job. We need to reliably create light without a colour cast. When manufacturers make light sources for photography they try to ensure that the light they create is ‘Daylight balanced’. Which means the light that is emitted by that source is a close colour-match to daylight or some other stated standard. Of course the colour of daylight varies – the colour of dawn and dusk is very different to a sunny mid-day or a rainy afternoon. Those colour differences are because of the affect that the atmosphere has on the light from the Sun. In fact, the Sun has a well known colour. So do other light sources. The colour of a light source is a result of its ‘colour temperature’. The ‘colour temperature’ of a light is measured in temperature units called Kelvins, after the famous physicist Lord Kelvin. Kelvins are usually designated with a capital K – so we say 5,000K meaning five thousand Kelvins. The measure of Kelvins is important to photographers because the colour of the light needs to be defined. By way of example it helps to think how an iron bar heats up. If we put iron in burning coals it gradually changes colour as it heats. First, it goes a very dull reddish colour. More heat and it goes bright red. As it heats more it gets orangey, then yellow. Next it turns slightly green then on to white – the hottest heat. The colours given off define the colour temperatures. Our language confuses things. Sitting around the camp fire we are ‘warm’. As a result we think of our day to day ‘warm’ colours as reds. But actually they are cool colours on the Kelvin scale. Compared to the temperature of the Sun they are very cool! 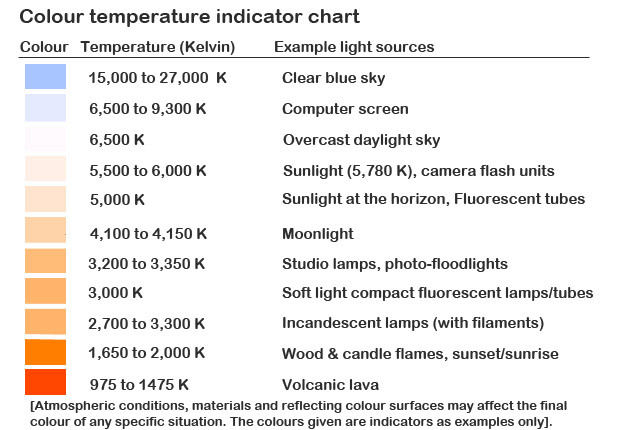 The Kelvin scale gives us the colour temperature indicators. The lower the Kelvin colour temperature, the more yellow to red the light. Higher colour temperatures is the bluer-to-white light range. Bluish/white (higher than 6,000K to 27,000K). The colour temperature relates to the colour of a thermal light source. However, other light sources (eg. chemical or fluorescent) may have a colour on the colour temperature scale. They do not necessarily have an actual thermal temperature to match. So the colours are indicative and not actual temperatures. You might therefore burn yourself on a tungsten filament bulb – a thermal source. You might not burn yourself on a low-energy soft fluorescent bulb as the process for creating the light is not thermal. However, the colour the light produces can still be seen on the colour temperature scale. See a colour chart of colour temperature examples. A light bulb with a filament creates light by the electricity heating the filament until it emits radiation. It’s a thermal source. Incandescent bulbs are really very inefficient. Only about 10% of their light is visible. Incandescent bulbs can create a strong colour cast. 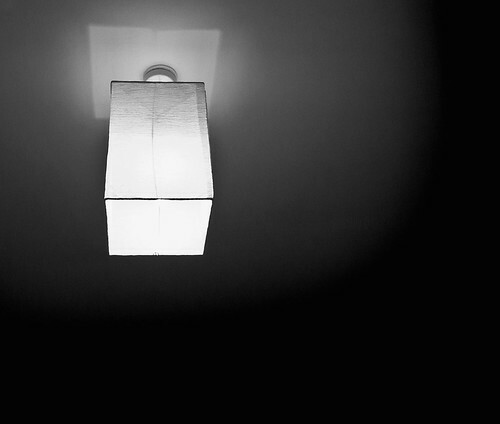 If you are shooting on auto-settings (and using *.jpg files) make sure you check any shot you take under such a bulb. If you find you have an odd colour then you will need to adjust the white balance of the camera to get rid of the colour. Normally digital cameras have an easy menu setting for white balance. You may see it marked as a light bulb icon. Alternatively it may be called ‘Tungsten’. The latter is a metal often used in the filament of bulbs. The setting should compensate for your colour cast. Some bulbs may vary. So test by ‘chimping’ to get it right. Check your cameras manual to find out how to adjust the white balance setting. You should do it when you shoot, as you will not be able to adjust it later (unless you are shooting in a RAW file format). Strip lighting, or fluorescent tubes and modern low energy bulbs all produce a colour cast (unless daylight adjusted when manufactured). As with the light created by bulbs with filaments, you can adjust for it in your camera. There is generally a tube icon or a fluorescent setting in the white balance menu. Consider the light you are working with carefully. Not all fluorescent lights have the same colour and some settings on your camera may not be quite right for your setting. So be prepared to experiment. There are literally hundreds of words that describe light, its colours and various conditions and states. It helps to have a good vocabulary of light as you may find it easier to read about light and talk to others if you know the right terms. We have compiled a list of some of the most significant to photographers. We are also adding to it… So let us know if there are terms that you think should be in the list! You can find our ‘Light’ word list here. This entry was posted in Background Info., Insights, Light and Lighting, Starters School and tagged Color Temperature, Colour Temperature, Fluorescent, jpg, Light, RAW, Tungsten, Vocabulary. Bookmark the permalink.